Discussions Magazine Music Blog: SILKY SOUL MUSIC, the brand new tribute album to Frankie Beverly and MAZE! 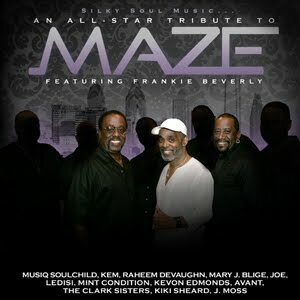 SILKY SOUL MUSIC, the brand new tribute album to Frankie Beverly and MAZE! Silky Soul Music is the brainchild of Frankie Beverly's son, Anthony, who is serving as the project's executive and co producer. Beverly developed the idea to properly honor his father's contributions to the music industry in a way that has never been done before. It is the first and only album recognizing Beverly and Maze's nearly 40-year career including 12 albums and 30 hit singles. The 10 songs selected for the CD represent some of Maze and Frankie Beverly's greatest hits. Featured are a host of Grammy Award winning and nominated gold and platinum-selling artists in R&B and Gospel, including Joe, Avant, Mary J. Blige, Mint Condition, Raheem DeVaughn, and the Clark Sisters. Here's just a taster of what you'll find on Silky Soul Music!